BEST VIEW! NOW BOOKING COOL SUMMER NIGHTS! Pls email B4 Booking for Better Rate! 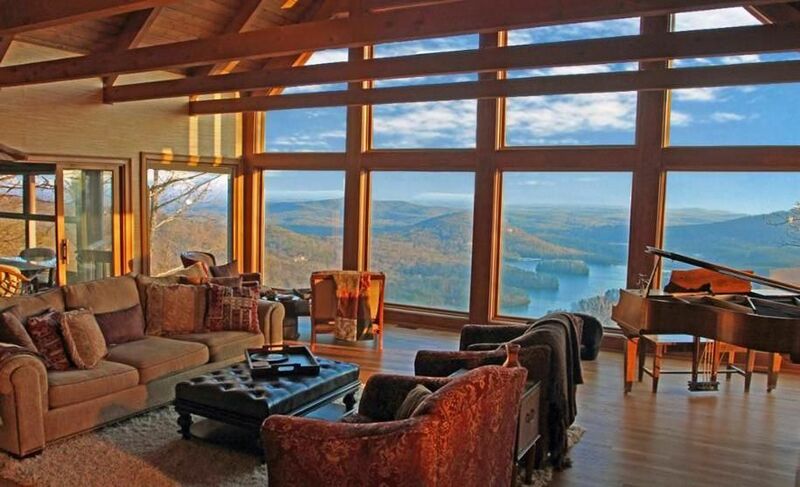 Home located 1 hr north of atlanta..Stunning interior view of the lake and night lights of Big Canoe with long range mountain views including the Atlanta skyline on clear days. Enormous great room with stunning two story fireplace and floor to ceiling windows. Master on main with king bed, private sitting area with fireplace and screened porch. Main level has gourmet kitchen, brand new appliances, dining and keeping room. Second master br upstairs with queen bed/private bath. Additional upstairs bedroom/private bath with twin beds and private balcony. Lower level has game room with pool table and 60in smarttv, separate cinema room with 120in projection hdtv, and two additional bedrooms(king/2 twins) with baths. Large wrap around deck with plenty of space to enjoy fresh mountain air. Close to many of the North Georgia Wineries and Wedding Venues!! All of Big Canoe's amenities are available to our guests! Great Room Has wood burning fireplace with abundant wood. Master has Gas FP. Beautiful home with everything needed for the weekend. Beautiful view of the mountains and Atlanta skyline. Fire ready to light and wine on the bar! The owner was readily available for questions. Many porches to relax on and enjoy the beautiful views on all levels. Game room and home theater great for nighttime entertainment. It definitely felt like a home away home. This was a perfect fit for what we needed. The views are Amazing, the driveway is perfect and you can fit several cars, was great for our dinner we had for 20 people. All around great facility with even more amazing views. Will definitely be back! Property has amazing vistas, very clean, accommodations were beyond expectation. Owner is very nice and communicative. Overall, fantastic experience. Highly recommended! This spacious house was perfect for our family of 7! The house was very clean, the kitchen was well stocked, and the view was gorgeous. We enjoyed what Big Canoe had to offer - the Swim Club, pontoon rental, and trails to the waterfalls. I held a women’s retreat here and couldn’t have been happier with how it turned out. Seriously blown away by the view. This house has everything you need for a pleasant mountain stay. We had a great weekend trip with the extended family. So much to do with the pool table, cinema room, games, great porches with swings perfect for reading. We also enjoyed the swim club at Big Canoe.